We are thinking of keeping back a couple of puppies from our fall and winter litters of 2017 and into early 2018, so do feel welcome to email or call if this is something you are interested in. Preference may be given to families within easy driving distance on Vancouver Island. Being a guardian home can be a wonderful arrangement that is beneficial to dog, breeder, and the family that fosters the dog. 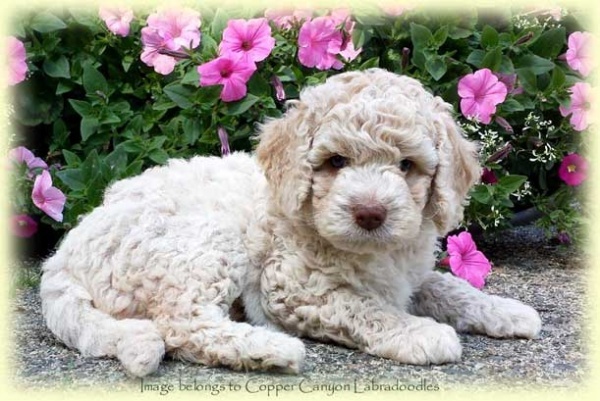 Copper Canyon Labradoodles has an Australian Labradoodle Foster Program for families in the Vancouver BC area. Instead of kenneling their dogs, Copper Canyon Labradoodles places them with an appropriate family from the time they are a young age. This ensures that the animal is socialized properly and grows up in a loving, family home. When the dog is old enough for breeding, they return to Copper Canyon to be bred. The girls are with their guardian families when they are pregnant, return to Copper Canyon when the puppies are due, and then go back to their families when the puppies are weaned. After the contract is finished, Copper Canyon spays or neuters the dog and they are returned to their foster family on a permanent basis. Contact Copper Canyon Labradoodles for more information about the foster program requirements and whether your family is a good fit for the program. Fostering a dog can be an excellent way to have a top quality dog for a family pet. We do not believe in the long term kenneling of our dogs. Dogs raised in kennels often do not get the socialization and stimulation that is needed to be a well balanced, happy animal. Therefore, we like to place our upcoming babies in forever homes with suitable families as their dog and we retain breeding rights. We pay for all health testing, and when the dog is old enough, they come back to our home for breeding and whelping. When the dog reaches the age (usually somewhere around the age of five or six for girls) where they should be retired from breeding, we spay the dog for you and the dog enjoys the wonderful home it’s had all it’s life. Males are usually retained for siring babies for longer, but do not need to leave their families for long periods. provide veterinary care when needed and to notify the breeder of what has transpired! Copper Canyon Labradoodles does charge a $600 dollar security deposit for our guardian dogs, and $200 per litter is returned when the female has a litter for us. We feel that people often do not value what comes without cost and a nominal fee encourages foster families to think seriously before bringing a dog into the home. Please understand that a foster or guardian arrangement is meant to be a PERMANENT home for the dog; it becomes YOUR dog and it is very hard on a dog to be rehomed after it is used to you and has grown to love your family! Contact us if you are interested in being a part of our foster/guardian program. Much of this contract is similar to our health guarantee, but certain clauses are different and so it is posted for your perusal. If you think our foster program interests you, please feel free to contact us and see what we have coming available for fostering.